There is probably no question that is as common to man as that of who God is. You would think that after thousands of years, more people would have it right. So many books, essays and websites have been dedicated to the idea of God that one could spend a lifetime reading and still not come to a knowledge of the truth. That's why it is important to find an authoritative source. It seems that everyone at some time in their life goes through their own soul-searching to determine what they believe about God. Most inherit the traditions of their fathers and are content with the basic idea of faith in God and, if they grew up in a Christian nation, acceptance of the Bible and Jesus Christ as the Savior of all mankind, who redeems us from death and hell. As a member of The Church of Jesus Christ of Latter-day Saints all my life, I have been blessed to have grown up with a different kind of knowledge about God. We proclaim to the world that we have been given a restored or revealed doctrine about God, our Heavenly Father and his Son, Jesus Christ. This knowledge through the prophet Joseph Smith we gladly share with the world. Almost any child in a Mormon Primary class can tell you that God the Father and his Son Jesus Christ are two separate and distinct individuals. We know this because Joseph Smith, a young boy from upstate New York, went into a grove of woods to pray and ask God which church to join. He shared his story at first with family and friends and later declared it to all the world. A clear understanding of the nature of God is one of the most fundamental and important foundations we need in this life to be able to successfully exercise faith. Without knowing to whom we are praying, our minds will be filled with doubts. Doubt and faith cannot exist together at the same time. The one throws out the other. One is filled with light and the other darkness. There is no confusion in our church about the nature of God. The doctrines are clear and always have been, at least they have been for me. However, for some who came into the church later in life, it can be a lifelong struggle, even after they are baptized, to put off their old and incorrect understandings about God. As one example, let's consider the case of Paul Toscano. Paul and I grew up in the same city of West Covina, California. We went to the same elementary and high schools. When he joined the church, we attended meetings in the same building. He was in the Baldwin Park 2nd ward and my family was in the Covina 1st ward. Paul is a little older than me, but went to BYU about the same time as my sisters in the late sixties. I bring up Paul because as a convert from Catholicism, you can imagine that the revelations and teachings of Joseph Smith must have been very different from those that were familiar to him as a young man. Paul's conversion story is featured in volume two of Hartman and Connie Rector's books, No More Strangers. After attending BYU, Paul served as a successful missionary in Italy. Paul is an extremely intelligent and outspoken man. Although some do not agree, I find him to be enjoyable to listen to because he is not shy about expressing himself and has such a wealth of knowledge in his mind. You can find several videos of Paul on the Internet delivering Sunstone speeches, but these interviews from John Dehlin on Mormon Stories are the best resource. At one time Paul wrote, "Even if the price of conversion is painful, it is worth it. Not all the pain and tribulation in the world can be compared with the glory that shall be revealed in faithful members of the Church..." (Source: No More Strangers) Today he has lost his faith. He says that Jesus Christ, while an exemplary human being, may not have actually been the Son of God. He also writes that The Book of Mormon is not really history, but an epic with some revealing truths. He has said that Joseph Smith meant well, but likely wasn't inspired of God. Toscano, in his words, no longer considers Joseph a hero to him. He considers moral sins to be nothing compared to the greater sins of intellectual oppression he sees in the leadership of the church. Because Paul is so gifted in intellectual ability, he can run circles around most of us when it comes to discussing the gospel of Jesus Christ. But Paul has lost sight of this basic doctrine of Salvation, that God the Father and his Son are two separate and distinct individuals. He seems stuck on the idea that Jesus is really the Father and claims that we should worship him as such. The First Presidency issued a statement on The Origin of Man in 1909 that is considered a classic in Mormon theology. Although not specifically addressing the subject we are considering, it contains much helpful information on the Godhead. And of course, there is this doctrinal essay on The Father and the Son that helps explain the concept of Divine Investiture of Authority. President Hinckley gave a wonderful message on the distinct nature of the members of the Godhead in this First Presidency message in the July 2006 issue of the Ensign magazine. Elder Hales spoke with great spiritual depth in this April 2008 General Conference address entitled, "Gaining a Testimony of God the Father; His Son, Jesus Christ; and the Holy Ghost". I can see how someone can arrive at a different conclusion as to the distinct nature of God and Jesus Christ by reading Abinadi's words in Mosiah Chapter 15. I was confused the first time I read that as a youth. That's another reason I am so grateful for so many years of Seminary, Institute and Gospel Doctrine classes, including several years of teaching the Book of Mormon. Jesus Christ is the Father as Creator. Christ is referred to in many scriptural passages as “the very Eternal Father of heaven and of earth” (see Mosiah 15:4, 16:15, Alma 11:38–39, Ether 4:7). He created or organized the earth under the direction of God the Father. Referring to him as the Father of Heaven and Earth is very comforting but it does not mean that he is God the Father. He is the Father of all who accept his atoning sacrifice and covenant with him to obey his everlasting gospel. There are numerous scriptural passages that express this relationship (see Mosiah 5:7, 15:10–13, Ether 3:14, D&C 25:1, 34:1–3, 39:1–4). In other words, he is the Father of all those who are saved through obedience to the laws and ordinances of the gospel. He is the Father by divine investiture of authority. This means that the Savior is the fully authorized and commissioned representative of his Father, and as such can speak and act for the Father. There are many examples of this in the scriptures. I encountered one in my studies this week in the Pearl of Great Price as the Lord was addressing Moses but speaking as the Father. When I kneel down to pray at night, there is no doubt in my mind to whom I am speaking. I am praying to a loving Heavenly Father who has all power to help me and wants to do so. I feel his encouragement and love through the gift of the Holy Ghost which has been bestowed upon me. I received it by the laying on of hands from those who are authorized to administer that ordinance. There is no confusion in my mind as to who Jesus Christ is. He is God's only Begotten Son in the flesh, meaning that he is divine. His Father was God and his mother was Mary. He is my Savior, my Redeemer, my Lord, My God and my King. I love Him. I worship Him. I serve him and I obey him. He is my friend. He suffered for me in the Garden of Gethsemane so I can repent. The gospel is not complicated. We do not need to get hung up on intellectual pursuits that lead us nowhere. I hope I never lose sight of the basics of the gospel of Jesus Christ. How grateful I am to a loving Heavenly Father who sent his Son to redeem the world. It is a miracle. All I know is that when I repent and strive to be obedient that I am happy. What more can I ask? Tim, thank you for giving me something to focus my thoughts on each morning. I check out your blog every morning before I head out to teach my third graders. I admire your ability to put so much meaning into a very enjoyable column. One of these days I hope to be able to spend time writing more. As it is now, I'll just read your every morning. I was personally touched by your post about Jesus being our Father. I have long been confused and frustrated by those revelations in Mosiah spoken of by Abinidi. It was a hard concept to wrap my mind around. But through your concise and complete explanation, I have gained a greated insight into your Mormon idea of Jesus as God. Keep up the excellent and thought provoking work. You're a great writer. We lived in West Covina in the late 70s. Met Jared Demke. Did you know him or his family? Thanks for visiting my blog. I never met Jared that I recall, but I worked with his brother Mike for three or four years at an LDS-owned publishing company in Azusa back in the early 90's called price books and forms. I was sorry to note on your blog that Jared passed away in 2006. I read with interest your post on the Father and the Son doctrine in Mormonism and was surprised that you made reference to me. Although you grew up in West Covina, California, and apparently attended Covina High School, as I did, I do not remember that we were ever acquainted there. Your comment suggested that you knew me as a young person with the implication that your acquaintance with me then provided you some insight into my views. Frankly, I have no recollection of ever having met you at all; but my memory is not perfect. So, I may be wrong about this. If I am, please correct me. In any case, your assertion that my view that Christ is the Supreme Being is in error and constitutes a remnant of my Catholic upbringing is quite wrong. I was never a strong Catholic. I was converted to Mormonism at age 16, and Catholic teachings never had much influence on me. It is true that I have asserted the view that Christ is the Supreme Being and is the Father of scripture. I derived this view entirely from the teachings and revelations of Joseph Smith. Your view, which is commonly held by Latter-day Saints, does not adequately account for the various godhead concepts promulgated by Joseph Smith and that appear in the various cannonical works of Mormonism. The Old Testament presents one God. The Lectures on Faith, once published with the Doctrine and Covenants,presents two Gods. The New Testament and Doctrine and Covenants present three Gods. The Pearl of Great Price Books of Moses and Abraham present a council of Gods. The New Portage vision to Joseph Smith, Zebedee Coltrin, and probably Oliver Cowdery or Sidney Rigdon presents a godhead of the Father, Mother, and Son. The four versions of the First Vision present Jesus as the primary deity, but are actually unclear as to who it was that appeared with Jesus, except by implication from the words: "This is my beloved Son, hear him"--a phrase incidentally that could have been uttered by God the Father, or by Adam, Jesus's mortal progenitor. The discourses of Joseph Smith beginning in July of 1839 contain many complex statements regarding his deepening view of the godhead that contradict your statement that Mormonism's godhead teachings have always been straightforward and have never changed. This is particularly true of the Joseph Smith's "Adam-God" discourse of July 1839, his discourse on "Elias, Elijah, and Messiah," his discourse at the funeral of King Follet, and his last discourse on the godhead given on June 16, 1844. The complexity of his views has led some to say that he abandoned his early Christocentric concepts in favor of a more pagan view. I reject this. My reading of these discourses and the revelations in all the Standard Works leads me to believe that Joseph Smith always believed that Jesus was the Supreme Being, and that he descended below all things--that is that he exalted others above himself, becoming the Son of his own sons and daughters, thus exalting them by laying aside his sovereignty, his glory, and his power so that his children could be empowered, glorified, and exalted. When Nephi was presented with the vision of the Tree of Life, he was first presented with this act of condescension by Christ. The angel asked Nephi--Do you understand the condescension of God? Nephi said he did not. And at that point was shown the Virgin Mary--the portal through which Christ made himself lower than the angels--to use St. Paul's phrase. My understanding of Christ as Father, who makes of himself a Son, so that we can have access to him--a Creator who steps into his creation--a Supreme Being, who abdicates his supremacy for our sakes--this theology I did not get from Catholicism, but from one source only--Joseph Smith. I understand that other church leaders have made pronouncements at various times in an attempt to harmonize Joseph Smith's complex views with the simple concept that the godhead is composed of God the Father and his Son, Jesus. But these statements do not illuminate or give sufficient weight to or explanation of the many complex statements of Joseph Smith that contradict or at least complicate the simple view of a godhead composed of Father and Son, as two distinct personages, with Jesus in a subordinate role. There is nothing in the teachings of Joseph Smith that would put Jesus in a subordinate role in the godhead. It is true that Joseph Smith is no longer a hero for me, but I still consider him the most luminous of the prophets on the subject of the godhead. It is true that I accept the historical problems of the Book of Mormon as unresolved, but I have never said it is not an inspired book. Certainly, the Abinidi text in Mosiah 15 stands as one of the most lucid statments made on the subject of the godhead. I believe this statement constitutes the foundation of Joseph Smith's teachings on this subject, a foundation which he built upon throughout his life. Though it is true I lost my faith after being wrongly excommunicated; however, I never abandoned that faith. I lost it in the same way that one might lose one's sight after an accident. I do not believe that Joseph Smith was a fraud. I do not believe that Mormonism is a heresy. I do believe that the complex teachings of Joseph Smith on the godhead have been reduced to simple formulas. I understand that some people require simplicity in matters of religion. But I believe that such reductionism does not promote spiritual maturity. I must respectfully disagree with your view that in Mormonism godhead doctrine has ever been simple and straightforward. Such a view can only be taken if one ignores most of what Joseph Smith revealed about God. Notwithstanding this disagreement, I very much appreciated your comments, your serious interest in Mormon theology, and the effort you have made to provide this forum for the discussion of matters of import. I hope it was a pleasant surprise to find your name associated with an essay of the doctrine of the Godhead. You have written a lot on the subject over the years. The story I related was gathered mainly from viewing the video interviews with John Dehlin. Additional biographical material was discovered on various websites, including your own. We have never met. I did not intend to suggest that I knew you or that I have any special insight on your views. I was delighted to hear you relate the story of your younger days to John and simply noted the similarities in geography. I suspect that my older sisters either knew you or knew of you, either though the young single adult programs of the day or through common experience at BYU. My premise in using your conversion story as an example of someone not being able to completely shake previous views of God was a mistake. Thank you for correcting me on this point. I confess that I am surprised to read that you have taken your views of the Godhead completely from the teachings of the prophet Joseph. I’m sure you realize that what you propose is not consistent with standard LDS orthodox teachings on the Godhead. You use the phrase, "Christ is the Supreme Being" throughout your reply to my essay. That confuses me. When I think of a Supreme Being, I think of God the Father. I suspect that that is going to be the center of our disagreement if we continue this dialog. Has it been your experience that this is the central theme of your differences with other members of the church as well? You mentioned various godhead concepts being promulgated by Joseph Smith. You also cite several sources, the pursuit of which has consumed the majority of my time in preparing my response. I know you have studied church history and the early theology of the church in great detail. Your work deserves respect and serious consideration. I confess I have read only summaries and reviews. I hope we can agree in the concept of continuing revelation. Thus I can accept that Joseph learned more and more about God with each spiritual communication. However, we know that God changes not. Therefore, what Joseph learned and taught later in his ministry should be consistent with what he discovered for himself after the initial theophany and shared with family, friends and early converts. I am curious about the New Portage vision to which you refer. It is my understanding that the vision was of Adam and Eve, not of a Godhead of Father, Mother and Son. Perhaps my source is incomplete (Fred Collier: Unpublished revelations of the Prophets and Presidents of the Church). Can you provide another source for the vision, preferably online to which I can link? You refer to complex statements of Joseph that he made beginning in July of 1839 demonstrating evidence of his changing view of the Godhead. I reviewed several of the discourses you noted, including the King Follet discourse, the "Elias, Elijah and Messiah" discourse and his last discourse of June 16, 1844. I confess that it has been years since I cracked open my old copies of the History of the Church. I enjoyed the readings very much and appreciate you suggesting them. I did not find evidence of changing of the doctrine of the Godhead. In fact, I struggled to find in the "Elias, Elijah, and Messiah" discourse of 10 March 1844 where the Godhead was even discussed. As to his last public discourse, what could be clearer than this: "I have always declared God to be a distinct personage, Jesus Christ a separate and distinct personage from God the Father, and that the Holy Ghost was a distinct personage and a spirit: and these three constitute three distinct personages and three Gods." Joseph teaches much more about the plurality of Gods before the rain ended his remarks. You mention several times that LDS theology puts Jesus in a subordinate role. I have never felt that way about our doctrine at all. Jesus was a God before he came to this earth. He created this world for us. He came to this world to redeem it and us. He is the true God of this world. All of our dealings have been with him. The Father has only appeared on rare occasions to introduce the Son. It is through the Savior that we obtain forgiveness of sins and only through Him that we can approach the Father. It is He who will plead our case before the Father to allow us back into His presence. Jesus is God. He is equal with God the Father. They share the same power, glory and majesty. I will not comment on historical problems of the Book of Mormon that you mention as this essay is focused on the doctrine of the Godhead. Perhaps we can address that in another post. I will only say that I am not aware of unresolved historical problems. There are none in my mind at least. You mentioned that you were wrongly excommunicated. I am probably going to regret this, but perhaps you can point me to a source where I can read your side of the story and why it was wrong. Having participated in many disciplinary councils over the years, I would be interested in reading what you have to say that would shed some light on the subject. Is it because the direction to take the action was received from the Quorum of the Twelve that you feel it was wrong? I hope you can determine by my response that I have seriously reviewed your comments, done some refreshing research and pondered what you have said. Perhaps I have been more influenced by my recent experience in teaching Primary. Yes, I did tend to teach doctrines in a rather simple and uncomplicated manner. But that’s the beauty of the restored gospel of Jesus Christ – it’s simple enough for even a child to understand, yet has enough depth that one can spend a lifetime learning about God. Paul, I apologize for using your very public profile as an example in my essay of someone who could not shake incorrect doctrine from a previous religion. Thank you again for correcting me. I am honored that you took the time to respond to my essay. I have enjoyed digging again into history and theology over the past two days in a way that I have not done in years. Thank you for stirring my intellectual curiosity. I hope you will continue to visit my blog and add your comments to the dialog. Your response was very kind and very respectful. I am pleased and honored to discuss theology with you. Current circumstances require a hasty response, but I will respond in greater depth later this week. 1. I never had any significant disagreements with church members over my views because I never asserted them as doctrine in any final sense, only as speculation based on the very wonderful statements of Joseph Smith. 2. The New Portage visions is instructive. I believe, like you do, that the personages in that visions were Adam, Eve, and Jesus. 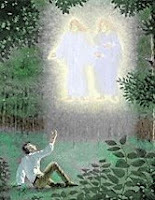 I believe that the Adam and Jesus appeared to Joseph Smith in the First Vision, as well. Adam is the "father" to whom Joseph Smither refers as the "Father." Jesus, though the Son of Adam, is also Adam's God. This is the gist of Joseph Smith's July 1839 discourse on Adam and the priesthood. 3. The discourse on Elias, Elijah, and Messiah is a discourse on three priesthood: (1) Elias represents the preparatory priesthoods (anything from the Levitical, the Aaronic, or the prpearatory priesthoods God provided to many others throughout the world--wome in Paganism, even). The priesthood of Elijah is the patriarchal Priesthood--in otherwords the priesthood of the father, meaning Father Adam and all subsequent patriarchs, which at the time of this discourse was the highest priesthood in the church. (3) The highest priesthood is the priesthood of the Son, the Messiah. This discourse places the work of the Son ahead of the Father. This is for the reason stated by Abinadi--the God himnself shall redeem his people. Christ is the everlasting Father. 4. You quoted from this discourse. I understand that the Father is distinct from the Son, but the Father is Adam. 5. I was wrongfully excommunicated because a person should not be excommunicated on the basis of a doctrincal disagreement. This was the position of Joseph Smith. He said that Mormons should be free to believe and speak on doctrine. What binds us together is not our agreement on doctrine, but the ordinances which tie us together as a spiritual family. I never denied the efficacy of the ordinances. In only disagreed with leaders and had my own views, which I never promulgated as the doctrines of the church, but only my private views. I write in haste Please forgive typos. I agree with you that Joseph Smith made some wonderful statements. I still discover new ones almost every day. New commentary by others on some of his statements bring them into new light that causes me to ponder different and deeper meanings. I imagine that is the process you have gone through in studying the words of the prophet of the restoration. I have read and re-read the two accounts of the New Portage Vision as found in volume two of Collier's unpublished revelations. I simply have been unable to find any reference to Jesus in the accounts. Zebedee is quoted in both instances as saying that Joseph identified the two personages they saw as Adam and Eve. Unless there is another account to which you can point me, I am missing the reference to the Savior. I also reviewed all accounts of the First Vision of which I am aware and could find no reference to Adam in any of the accounts. Some referred to one person later joined by a second but all identified them as God the Father and his Son Jesus Christ. Can you point me to some source that indicates that Joseph ever identified the Father as Adam? I agree with your that Jesus, though a descendant of Adam through his mother Mary, is Adam's God. Of course, we identify Jesus as Jehovah of the Old Testament. I reviewed Joseph Smith's 1839 discourse on Adam and the Priesthood (HC 3:385-388) and could come up with no corroboration that Joseph taught that Adam was God the Father. He is identified as the father of the human family, and as Michael the Archangel, as the oldest man and as the Ancient of Days, but never as God the Father. I once again reviewed the discourse on Elias, Elijah and Messiah searching for evidence that the work of the Son is placed ahead of the work of the Father. Perhaps the interpretation is acceptable in that we must come unto the Father through the Son. There is no other way as he is our Mediator. He stands between us and the Father. So yes, the work of the Son is required for us to be brought back into the presence of the Father. You state directly in point four that the Father is Adam. Perhaps you are thinking of the way that Brigham referred to God the Father as "Father Adam" on occasion. He believed that Adam was one of the names of God the Father. In fact, for him, it was not just a name but a role that he performed in another world. That is a deep and complex subject which I addressed in my essay on the Adam-God theory. Thank you for sharing your view that you were wrongly excommunicated for a doctrinal disagreement. I think the Brethren have been fairly clear about the doctrine of the Godhead, at least in our lifetime. Perhaps it was not as clearly defined in the early days of the Church, but I don't think one could argue that the official doctrine has not been clearly stated today. I don't know all the particulars but I think the issue was probably a very public insistence of the right to disagree with the official doctrine. Paul, once again, thank you for visiting my blog and for adding your comments on the subject of this essay. I am saddened by what happened to you and Margaret. I don't sense in your writings the bitter feelings that are expressed in those of Steve Benson. For some reason you seem like a kindred spirit to me. I pray all the best for you and your family and hope that all is well. Please accept an expression of my love and respect for both you and Margaret. Cheers! Thank you for your response to my ideas. It is amazing to me how two people of good will reading the same text can arrive of such different conclusions. This, perhaps, is good enough reason for not excommunicating people for doctrinal disagreements. Anyway, I have just completed a paper entitled "Whether There Be One God Or Many," which I am planning to present at this year's Sunstone Symposium in Salt Lake City. Perhaps in that paper I will be a little clearer about my ideas. That's because I don't have the background and understanding that you have of what's behind those texts. I know you have read and studied a lot of documents that I have not, which have allowed you to come to your conclusions. I'm looking forward to reading your paper after it is presented at Sunstone. Thanks for the visit. It is amazing to me how two people of good will reading the same text can arrive of such different conclusions. This, perhaps, is good enough reason for not excommunicating people for doctrinal disagreements. Anyway, I have just completed a paper entitled peluang usaha kecil sampingan "Whether There Be One God Or Many," which I am planning to present at this year's Sunstone Symposium in Salt Lake City. Perhaps in that paper I will be a little clearer about my ideas.